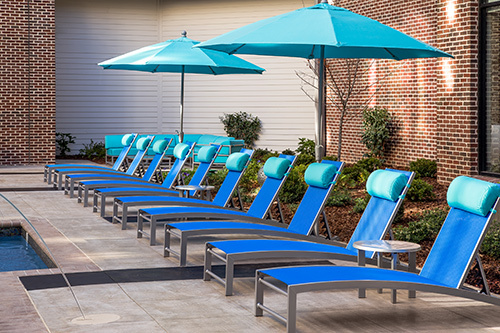 Leisure Creations furniture is extremely durable and built specifically for common everyday use outdoors. But, proper maintenance is the only way to ensure it looks and works as good on year 5 as it did on day 1. Here are some helpful instructions on how to maintain your quality outdoor furniture. Wash the table top using a soft cloth with a solution of water and mild detergent. Rinse with clean water. Wash frames using a soft cloth and a solution of water and mild detergent and rinse with clean water. For more stubborn stains, you may use a mild abrasive such as Soft Scrub (regular – NO bleach). Periodic waxing with a paste or clear automobile wax can be performed on smooth frame finishes. This will help protect against exposure to sunlight and salty air. Be sure to inspect nylon glides frequently and replace if worn or missing. This will help prolong the life of your furniture. To protect your vinyl from build-up and mildew growth clean frequently with a solution of mild dishwashing detergent, such as Dawn and ½ cup of white vinegar to two gallons of warm water. Rinse with clean water. For more stubborn stains, you may use a mild abrasive such as Soft Scrub (regular – NO bleach). Periodic paste waxing or use of Armor All® will prolong strap life and help reduce staining. Do not use strong detergents or bleach, solvents such as methyl, ethyl, ketone, acetone or paint thinner. Do not use power washers. Suntan and sunblock products may be harmful to cushions, sling and vinyl. Do not allow such products to come in contact with seating surfaces to avoid deep penetrating stains, which are not covered under warranty.